In my last blog, I went through my personal process of selecting a palette, choosing the right chord or color key that achieves the practical aspect of mixing the right combinations with the visual sensuality to evoke a heightened sense of emotion. 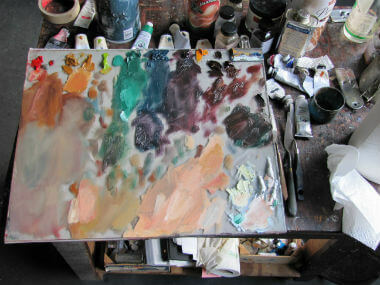 Since I have begun the larger canvas, I thought I would share my palette in a visual way. One cannot really comprehend the depth of color and the infinite possibilities until one actually mixes the paint. Everyone wants the quick formula to get a desired result. There are numerous magazines on technique but it is only in the very act of painting with your subject before you and the intention in your heart that one can find the right and true way for oneself. Robert Henri states in his The Art Spirit, “There will be new ideas in painting and each new idea will have a new technique.” (The Art Spirit,p.67) Technique is developed when the artist is faced with the challenge of trying to paint something that he has never attempted before and he uses his inner resources when presented with the problem to achieve “new” results. It is the sheer inventiveness of the artist that prevails. So don’t look at what I am going to present as an end all, but look at it as a window into what this artist has done to paint this painting at this moment with these emotions that lie presently in her heart. One thing you will notice is an L with a block around it on the right side. This symbol describes what Henri called a lightener. This refers to a substitute for white. As you may have noticed there is no white on the palette, instead there is this light color made from YG + White. Instead of using white to lighten a color combination, I use this. This refers to Henri’s idea of a super-color. A super-color reflects the color of the light source. It is like the light from a sunset. When we observe a sunset, that warm orange, gold color, it affects how one sees all objects in its glow. Every object takes on the super-color. It is the same if one is working in a studio, the cool north light from the window, affects all those object that are bathed in it. So this cool yellow-green acts as a reflection of my light source. You will also notice the wonderful grays that I was able to mix in the opening image of my working palette along the left edge. These grays were perfect for the shadow edge when one is presented, most times, with an indescribable color that is hard to identify. Sometimes I made it too green and needed to add this gray to get the right balance. In a chord , it is the grays and muted tones that bring out the inherent richness in the color. Another thing that is important to note is that the color of the chord needs to be seen in some way in a pure state. If I over mix the colors, I do not achieve the vibration and luminosity of the color chord. Then, essentially, I have eliminated the very reason for the chord and its emotional vibrancy. This is the main reason I paint a color study prior to working on the large canvas- how much can I leave the color in the chord independent and unadulterated? When you look at the chord or key you will notice that the chord provides neutralized and semi- neutralized colors that act as a foil for the more luminous ones. They are the Bi colors and the Hues. It is this balance that must be maintained.When the balance is achieved than the whole painting sings of color. And that is what you want -to sing a new song that is true and beautiful. In the diagram above, you show that RO bi is obtained by combining YG and R; PR bi by combining GB and R; but you say you obtain Red H not by combining G + R, but O + P. How do you arrive at that? R Hue is the combination of the secondary colors of O+P. Not R+G, which is completely neutralized. O+P still is more red and hence becomes R Hue, not the total absence of a color bias. Refer to my reply On A Color Triad-Practical. This palette in my blog, Setting a Palette, is not a chord. 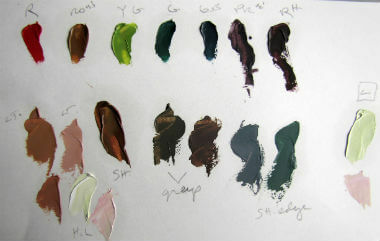 It is another type of palette called ‘Three set against a complement”.So you are right that the complement is present. 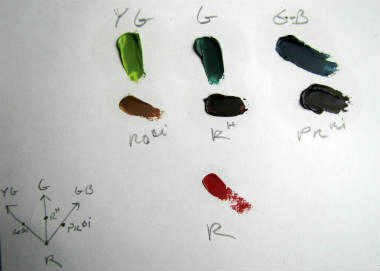 Is RO bi the color made from YG + R, and PR bi from GB + R; and what does “bi” mean? If R hue = O + P, where does it come from in this diagram/illustration; from the O in the RO bi and the P in the PR bi? You are correct regarding RObi and PRbi. They are Bi, I believe, because they are on the second line below the full intensity colors and the Hues are on the third line below the pure spectrum. Marratta nor Henri explain it properly, but this is my assumption.They also, never contain a primary color, only a secondary and a tertiary. Thanks Judith for showing and so clearly explaning some of some of what you do when you work your magic. I know you have worked long and hard with the color chords to fully develop the amazing ability you have to express your self through your art and your sublime color. I mean that I think that your soul naturally sings color and that your study and practice have brought it to perfect harmony.